I can’t roll my eyes hard enough over this one. 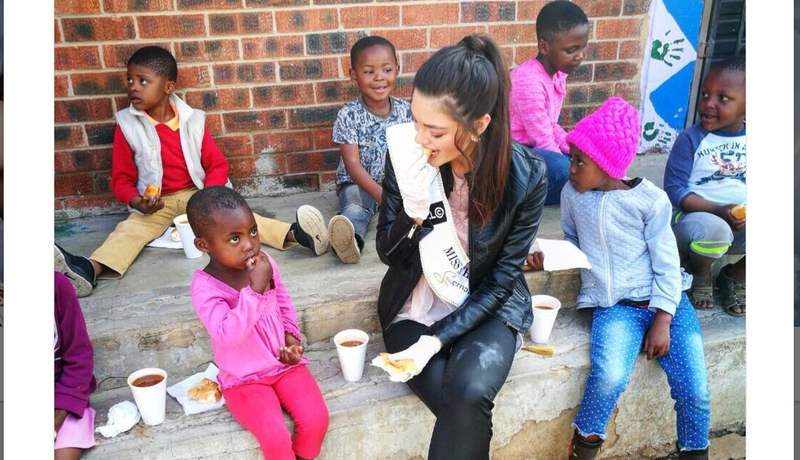 Miss South Africa has sparked the ire of the internet after images emerged of her wearing gloves while visiting an orphanage for HIV-positive children in Johannesburg. Almost immediately, black (African) Twitter went to work. Many were outraged, including one asking, “Do you always eat with the gloves on?? ?” and posting photos of Peters hugging white children and dogs sans gloves. The 22-year-old Nel-Peters released a video on the same day in response, saying that she wore the gloves to be as “hygienic as possible,” and that her intentions were “completely misunderstood” and apologizing. “The real story was that 300 kids got a proper warm lunch and they got that with or without gloves,” Nel-Peters noted. Oh? Predictably, Twitter laughed in her face with the hashtag #MissSAChallenge, showing South Africans in gloves doing everyday things, including putting on lotion. It’s good to know that black Twitter works around the world. PSA: The nation of South Africa has been ravaged by HIV and AIDS and has the largest number of HIV-positive adults in the world. According to Avert, South Africa had an estimated 7 million people living with HIV in 2015. In the same year, there were 380,000 new infections, and 180,000 South Africans died from AIDS-related illnesses. Millions of children in South Africa have been orphaned by AIDS. By the way, “AIDS Awareness Day” was trending on Twitter on Tuesday, though I’m not sure it’s real. Regardless, let’s use the day to recommit to ending this devastating disease that disproportionately affects people of color, killing many and stigmatizing many more. Editor’s note: The statistics on HIV/AIDS in South Africa have been updated.